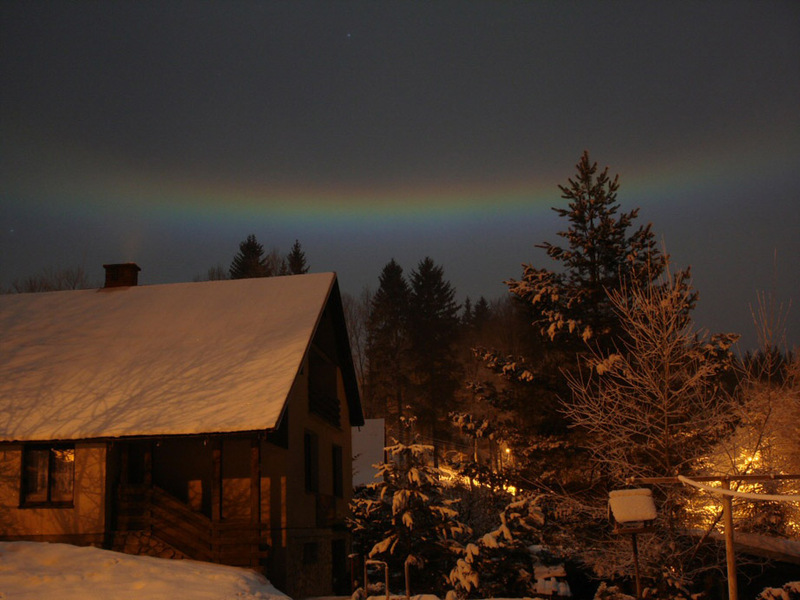 When I first saw photos by Vaclav Fego captured on December 22, 2007 in Vitkovice in Krkonose mountains I told myself just one thing – wow, that is amazing, I haven’t seen anything similar for a long time! 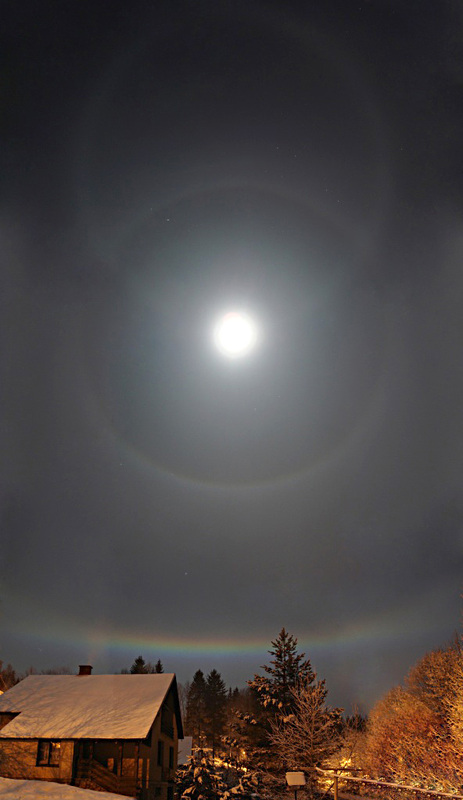 On the images of this Moon halo display is visible bright and colorful circumhorizon arc together with short projections of infralateral arc low above the southern horizon. 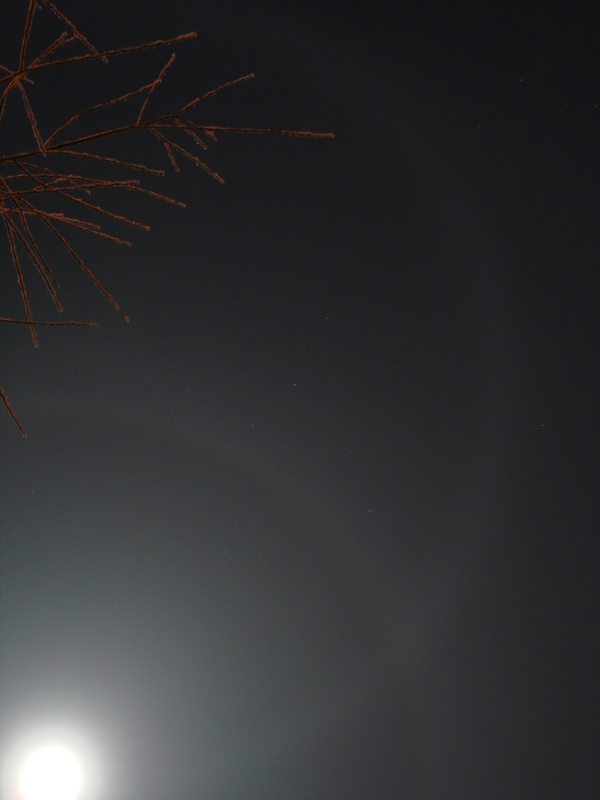 Also 22° halo with Parry arc and full paraselenic circle are seen. 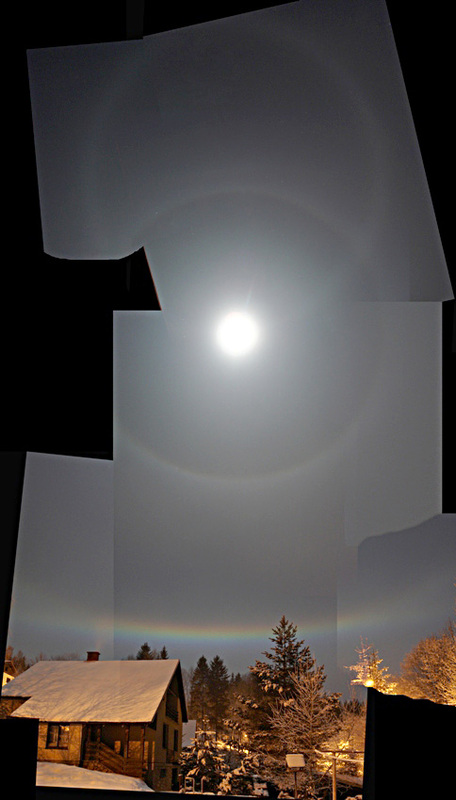 Here is one photo pointed at higher up in the sky and here is a composite image. Circumhorizon arc appears when elevation of the Moon (or Sun) is 58° or more above the horizon. In this case the elevation of the Moon was 66°, which is several degrees more than that of the Sun at noon at summer solstice in the Czech Republic (the inclination of the Moon’s orbit to the ecliptic can position the Moon 5° higher)! From Bedřichov u Kralovky, photo by Vladimir Wasserbauer and from Paseky nad Jizerou, photo by Čenda Jirak. I have seen cha in diamond dust with the streetlamps, but never seen a photo of diamond dust cha with moon or sun. Generally, there are very little photos of diamond dust displays with high light source elevations and this may be the highest so far. Great display. The sharp high sun Parry, separated from 22° is also good. We don't see them that often either. I thought helic arc would show up with usm, but it didn't. 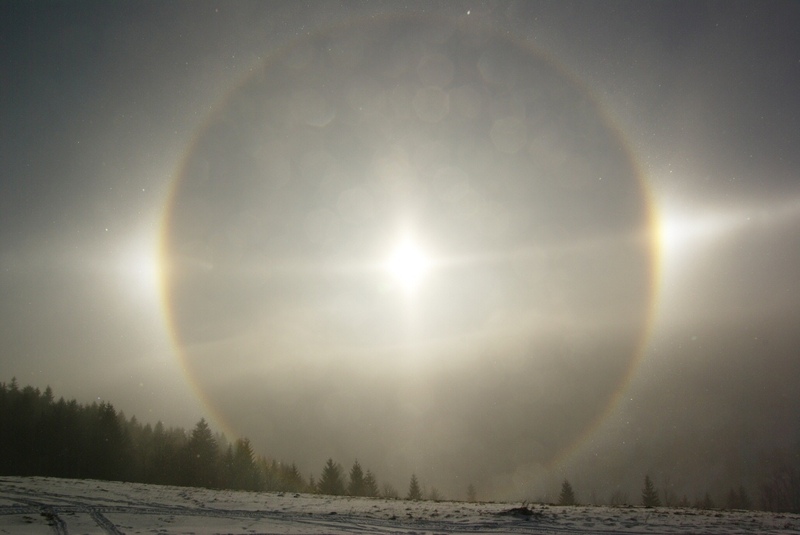 I have been a fan of the late December Czech diamond-dust halos and also a returning visitor to the Czech site to see photographs of these amazing displays. Actually this CHA is one of my favourites. The ones I saw this summer cannot even be compared to this one. Martin, Lucas. 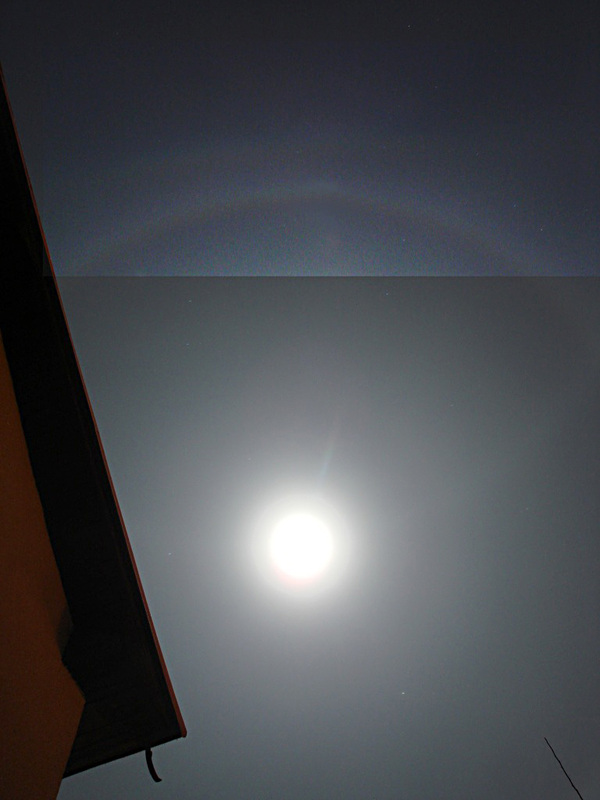 It that 22° halo there or circumscribed halo? If it is 22° halo, then the arc trailing off from the CHA can't be 46° infra, but must be a segment of 46° halo. 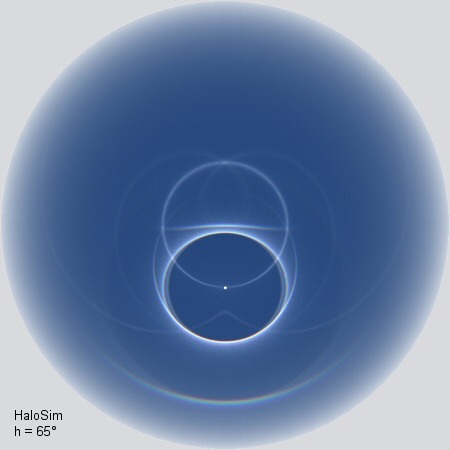 In the simulation there is both 22° halo and circumscribed halo, which does not seem to be the case in the display. What a fantastic circumhorizontal arc!!! 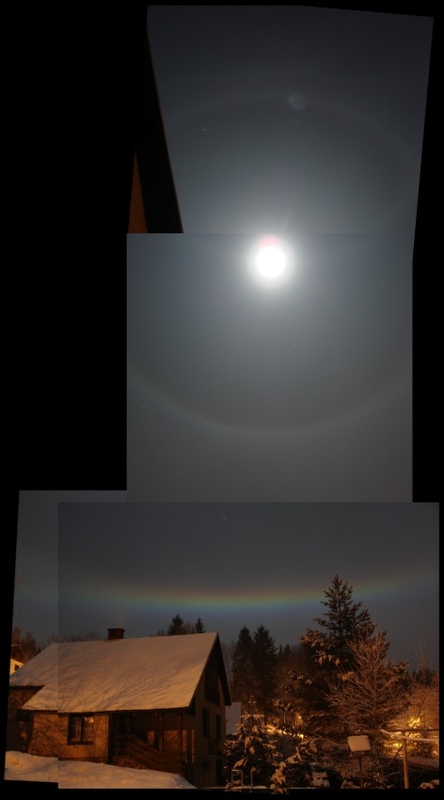 I didn't know that a moon halo could produce such great colors! I guess if it was the sun at that height (66 degrees, almost optimal) this CHA could be compared with the famous Spokane-display. Ok, never mind the details. It is a great moon display. Yeah that is a very very nice because in regular cirrus clouds the CHA shows in fragments. With the diamond dust the arc is pure and smooth with now irregularities.I am surprised there was not lower suncave parry as well. The composite images reveal the grandeur of the whole display. Well done.